Energy Transfer has been building a network of pipelines in Pennsylvania that are designed to carry not only natural gas (primarily methane) from fracked Marcellus shale wells, but also the natural gas liquids (NGLs) that many shale wells produce as by-products. Those NGLs, which include ethane, butane, and propane, are prized by petrochemical companies and can be turned into plastics and a wide array of synthetic products. But the company – also at the center of Dakota Access, Bayou Bridge, and Rover pipeline controversies – racked up a troubling track record of law-breaking in Pennsylvania, causing sinkholes, water contamination, and an early-morning pipeline explosion. It separately remains under a criminal investigation by the Chester County district attorney. Friday’s order leaves one Energy Transfer (ET) NGL pipeline, a re-designed Mariner East 2, still flowing. Energy Transfer’s Mariner East 2X and Revolution pipelines have permits pending – and the company will not be able to obtain those permits until the company complies with state orders related to the Revolution pipeline. “Multiple inspections by [Department of Environmental Protection] staff, most recently in January 2019, found that ET had not fulfilled the terms of the order and was not progressing toward compliance,” Department of Environmental Protection Secretary Patrick McDonnell said Friday, February 8. That pipeline, the Revolution pipeline, had been in use only seven days when heavy rains caused a landslide on a steep slope about 25 miles outside Pittsburgh. Revolution’s subsequent leak caused a column of fire 150 feet high, destroyed a home, a barn, and multiple cars, and caused residents of over two dozen houses to be evacuated. The pipeline was designed to carry so-called “wet” or liquids-rich gas from Marcellus shale wells to a plant where liquids could be separated and then shipped on the Mariner East pipeline system. Roughly a month before Revolution exploded, Energy Transfer was fined for “a series of erosion events” about a mile from the blast site, the Pittsburgh Post-Gazette reported in January. That stretch of pipeline crosses several steep slopes, and a field survey of a nearby wetland shows Energy Transfer labeled it as a “slip landslide area” and “dangerous and unstable hillslope terrain,” the Post-Gazette found. Since September, Energy Transfer has been unable to stabilize the land near the blast-site. The company brought in heavy machinery – but had to abandon it on-site after state regulators found the ground was so unstable it was unsafe to operate the machines. The slopes remained partially barren of vegetation after the blast – which leaves the risk of future landslides elevated. Energy Transfer has tried to re-seed the slopes by spraying seed from helicopters, but so far, efforts have proved unsuccessful. 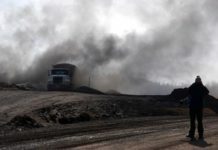 The company failed to report landslides following the blast, allowed construction activities in unpermitted areas, and even ran the pipeline’s path through old reclaimed mines, leading to acid mine drainage, according to violations issued by the state. All told, 27 pending permits for Energy Transfer pipeline projects are under review – and those reviews are all on hold, according to the Pennsylvania Department of Environmental Protection. The move announced Friday will still allow natural gas liquids, or NGLs, to continue flowing through a re-designed pipeline Energy Transfer dubbed Mariner East 2. This pipeline went into partial service at the end of 2018, carrying less than the 275,000 barrels a day of NGLs it was originally designed to carry, through a line that ranges in diameter from 12 inches to 20 inches. Another Mariner East pipe, the 70,000 barrel-a-day Mariner East 1, was shut down in January after a sinkhole opened up and exposed a portion of the buried pipe just yards from a house. That same month, the state’s Public Utility Commission refused to order a shutdown of Mariner East 2 over safety concerns. 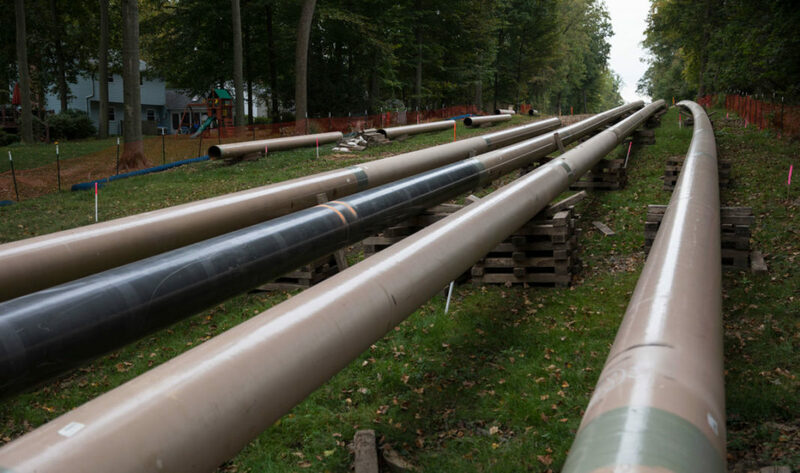 One pipe section now pressed into service as part of the “Mariner East 2” NGL pipeline was previously used to transport gasoline – and it caused a 33,000 gallon gasoline spill into a creek near Philadelphia the same month as the explosion of the Revolution pipeline. Mariner East 2 was designed to be a 20-inch pipe running roughly 350 miles across the south of Pennsylvania, but Energy Transfer has been unable to finish running that 20-inch pipe amid construction mishaps and state law violations. The pipeline Energy Transfer began using to ship NGLs at the end of December includes stretches of narrower 16-inch and 12-inch pipe, used to bypass areas where the wider pipe is not yet complete. That redesign – and the company’s safety track record – has locals worried. In November, a Reuters investigation examined Energy Transfer’s record building Mariner East 2 and its Rover pipeline in Ohio. They found the company had been issued more than 800 violations for breaking its state or federal permits on the two pipeline projects – compared to an industry-wide average of 19 violations per project. “Ohio’s negative experience with Rover has fundamentally changed how we will permit pipeline projects,” James Lee, a spokesperson for the Ohio Environmental Protection Agency said in a statement reported by The Hill, adding that Energy Transfer’s Rover pipeline “fundamentally changed” the state’s approach to authorizing pipeline work. Governor Wolf called for several reforms of state pipeline laws, as he expressed support for the hold. He urged the state’s Republican-controlled General Assembly to pass pending bills which would give the state’s Public Utility Commission say over a proposed in-state pipeline’s route, authority he said state regulators currently lack. He also expressed support for bills that would require builders to include more automatic shut-off valves and laws that would require pipeline operators to provide schools within 1,000 feet of a pipe and county emergency coordinators with more information. Pennsylvania environmental watchdogs said they supported the recent announcement, but called for further action by the state. Energy Transfer, now one of the country’s biggest pipeline companies, has expanded at a rapid clip since 2002, when it operated only 200 miles of pipeline. Today, it operates 83,000 miles of pipe. One of the largest Master Limited Partnerships in the U.S. (a corporate structure criticized by environmental watchdogs for offering fossil fuel companies exclusive tax benefits), Energy Transfer has gotten into the NGL business in a serious way. It operates 3,181 miles of pipelines specifically designed to carry NGLs – enough, the company says, to move nearly a million barrels of NGLs a day. It also owns NGL storage sites and chemical plants designed to separate ethane, propane, butane, and other NGLs in Texas and Louisiana. Energy Transfer is not the only company planning NGL infrastructure. In December, Shell obtained state permits to build its 97-mile Falcon pipeline to carry ethane to a planned plastics plant in Potter Township, though the company continues to face opposition from environmental and community groups. A recent Ambridge Water Authority permit drew over 1,000 public comments. The Mariner East pipes are designed to carry NGLs to an export terminal in Marcus Hook, Pennsylvania. From there, the fossil fuels will be shipped to Europe to make plastics and petrochemicals. 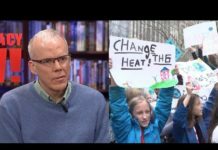 Although Energy Transfer announced that Mariner East 2 was up and running in December, the controversy over the pipeline has continued to make headlines. Hundreds of people attended a February 2 public hearing about the Mariner East pipeline system in Delaware County, outside Philadelphia.